iOS 4.2 for iPad is finally here, after much awaiting by most iPad owners. But you may be wondering, how do I install it, and what’s different? Well fear not my techie friends, as MakeTechEasier is here to walk you through the process! 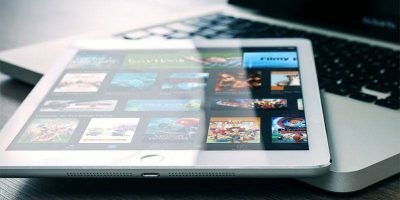 While installation is simple, its not blatantly obvious how to use some of the iPad’s new features, but it will be once you’re finished reading! That being said, let’s run down the steps to get the update on your iPad, as well as some tips to get the most out of your new iOS update! First, a quick disclaimer: Remember, you should always be backing up your iPad, as any software update can theoretically take a toll on your device if something went wrong. This is a fully stable release though, so everything should be quick and easy, but always better safe than sorry! To download and install iOS 4.2, you’ll need two things. First is the newest iTunes, which you can get at Apple.com/itunes/download. Once you install this new iTunes version, things only get easier. Its a standard install, so we won’t waste too much time with that, but now that you’ve got your new iTunes version installed, plug in your iPad and open iTunes! Once your new iTunes is installed and open, click your iPad in the left sidebar. Run a sync to backup your iPad. Once it is finished, click the Check for Update button and follow the prompts to download and install the update. Now let iTunes finish, and your iPad will restart. Once it does, it’s ready to roar! So you’ve got it installed, but how do you take advantage of its new feature set? First, let’s go over the two biggest changes. Most of these changes are no news to iPhone users. First, multitasking. This has been a big issue in previous iteration of the iOS. It is good that is now finally remedied. Apple solved the problem of multitasking in a simple, but useful way. 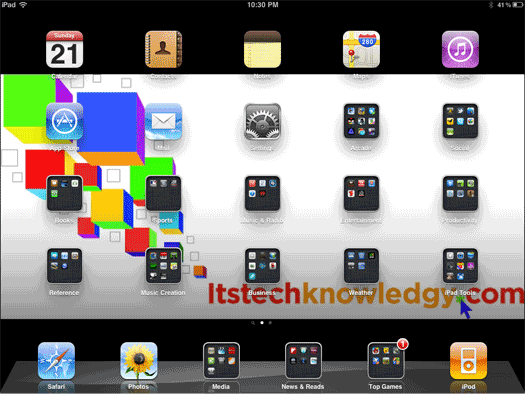 Prior to iOS 4.2 on iPad, when you clicked the Home button, you would be taken to your home screen and your app would close. Now, as long as the app has been developed to have multitasking support, the app freezes and goes into the background. Additionally, if approved by Apple (which most seem to be), they can continue to do things like play music in the background, i.e. Pandora and Last.fm. 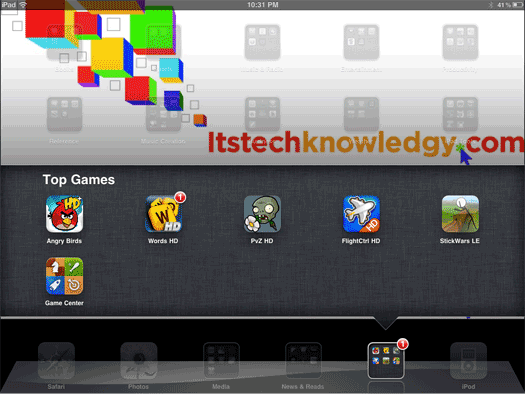 The second big feature brought by iOS 4.2 is the ability to add folders to your home screen. Now, instead of having a home screen full of game apps, you can just have one folder for all of your games, making home screens far more easy to navigate. For instance, I went from having 6 home screens plus the search to 2 home screens, making my apps far easier to find. 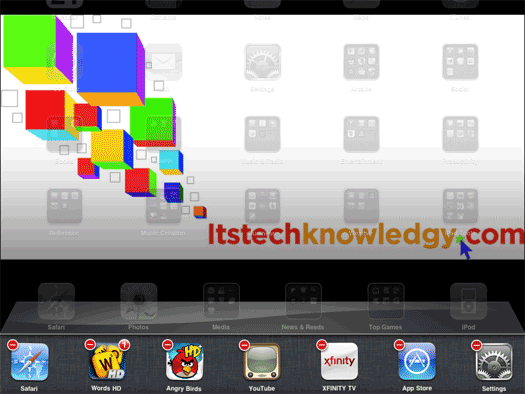 To use multitasking, just press your iPad’s Home button. The app will drop into the background. Now, to bring up recent and open apps, just double click the Home button. The bottom of your screen will rise up to reveal a dock of app icons. Pick one, and boom, up comes your app! The problem can come in though, when an app freezes, as does happen occasionally. Previously, you could just hit the home button to close the app, then open it back up to reset it. Now though, if the app has multitasking enabled, it may not close when you hit Home. To truly close an app, there is an easy trick. Just go to your Home screen and double click the Home button to bring up your current and recent apps. Then, hold one of them as if you were going to move it. Once they start jiggling, lift your finger, and you’ll notice that there are small minus signs in the top corners of each app. Click the minus to Quit the application. Now you can restart it completely, whenever you’d like to. Folders can be super convenient, and are incredibly easy to use. To create a folder for your games, for example, hold your finger on a game app’s icon, then let go when the app starts jiggling. Drag the app over top of another game and let it go. The iPad will automatically group them into a folder, and even try to name the folder based on what type of apps they are. Feel free to rename it if you like, but generally it is actually a pretty good guesser. You’ve now got a games folder that you can add your other games to, and move it to organize your Home screen, just like any other app icon. iOS 4.2 is a much needed, and incredibly complete update. With multitasking, folders, and some speed improvement, your iPad is now more of a computer than ever. What do you think of the update? What’s missing from it? Let us know in the comments! And how do you uninstall!? I’d like to downgrade ASAP – it slows my iPhone 4 down! Now the ones I paid for are not retrievable unless I pay for them again. Nice deal for you Apple, thanks for nothing. Have you checked to see if the apps are in iTunes? The first thing your iPad should have done was back up to iTunes. Double check to make sure they aren’t there, and if they are just check them to sync them up. If they are missing, I’ve read that with apps (not music or movies) you can go into the iTunes Store and hit Buy to get them again and as long as your logged in to the same account it will download again for free. I’d give it a shot, what have you got to lose? Can an iPad Take the Place of a Computer? How To Turn Your iPad Into An Alarm Clock – For Free!